Spellbinders Daisy Heads Flower is an easy adornment to make for any of your cards with lovely results. It is a die that has been around for quite some time but it never loses that ability to make pretty flowers. This Peach card has had several of each of the sizes of the flower heads cut out and then layered together. You can add as many of the layers as you wish for a bushier flower until you make your creation how you want it to look. The video is not long but it will show you how to get the look for your own cards and I am sure that you will not be disappointed with your efforts. And this is a good way to spend a wet afternoon creating a whole bunch of flowers and then keeping them safe to add to your cards in the future. Use up all your odd bits of paper and make them in colours that you know you will use. Add Glitter to some or Flower Soft for another look. Glue some feathers behind the flower or add in some big statement leaves. 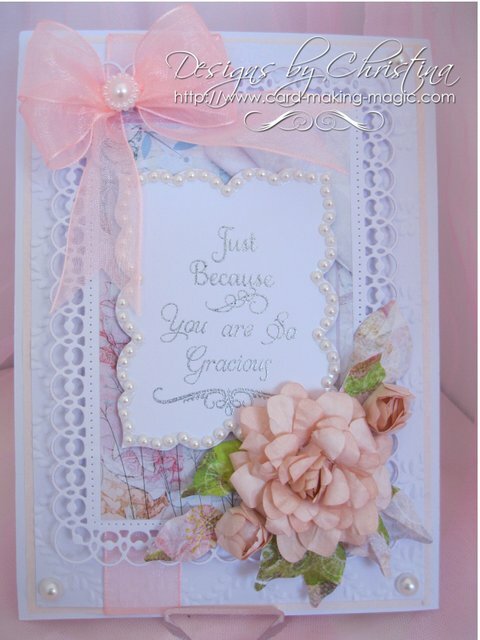 When it comes to adding flowers to your designs the world is your oyster and you can make it as pretty as you wish especially for all your girly cards. You will find Video tutorials for other flowers that will give a slightly different look to your designs... and these are some that feature Spellbinders. I hope you will have fun making these flowers and don't forget to add your cards to the Gallery Page to show the world what you can do.